Maybe I'm completely in left field, but it has been stated many times that Iraq has paid Iran 4 billion of the 12,000 billion owed to Iran. Yes specified 4 billion in dinars of the 12 billion owed. Nobody knows what was said between the two countries we can only speculate. If there were some understanding between Iraq and Iran regarding RV/RI, what if it were 3:1 Iran would get their 12,000 billion Dollars in the end????? 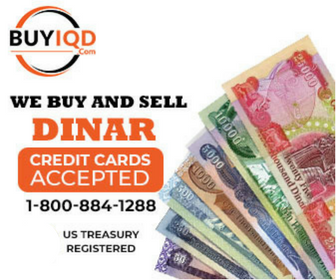 We have seen Iraq throwing around a lot larger numbers $dinar in other areas. Why 4 billion? Like I said, we have no idea of their PLANS of this new 'relationship' forming between these two countries...……..or again I may again be in left field! This ride has been a whole new education and Im still learning. Thank you Floridian and everyone else with all your assistance! Truth be told Im a Jersey Girl! .Where does it say about 200,000. Floridian, I absolutely know you can lead me to this article. Im VTW call me Vicky. Believe me, I have been here every step of the way for the last nine years. Im the quiet type...lol where does it US10,000/IQD100,000. Please correct me if Im wrong. That would hopefully start us at .10 cent float. Or am I completely lost? Does this guy have ties to Maliki? Mass confusion...you are so right. Can't imagine what the citizens of Iraq are dealing with, gotta be crazy. Don't get me wrong, I want the RV for some selfish lifestyle changes. But my heart goes out to every person affected by the negatives endured. On a smaller scale, I live in an area where every other house is in foreclosure. Something has gotta give! Thanks for your kindness! The official word FROM WELLS FARGO! Ron, I thank you for saying what I have wanted to say! Your known on the site, I'm a nobody...lol. Kaperoni - Confirmation The Notes We Hold Will Retain The Printed Value ! Everyone needs to remember, ALL POST are the believes of others. Guru or not!!!! We all have the right to make our own decision what to believe or not. We have all the information available to us. CHOICES>>>be diligent to find your truth or sit back n wait for information you may call a lie anyway. Blaino, thank you for your thoughts. Wrong or right they are your thoughts n opinions. Its up to each individual to be ok with yourself and your believes. Go RV!!! !